Business rate increases will total £152m in April, rates specialist CVS said, putting a heavier burden on firms already reeling from rising inflation. The prediction follows a drop in retail sales last month as inflation hit its highest level in more than five years. "For many shops, this may be the last straw," said Helen Dickinson, chief executive of British Retail Consortium. "Across the country, especially in economically deprived and vulnerable communities, the cost of failing to take action will likely be seen in yet more empty shops and gap-toothed High Streets," she added. Is now the time to raise interest rates? CVS says its research shows that 37,364 small shops will see their business rates bills rise above inflation next April, with 30,198 small shops facing rises in their rates bills of between 10% and 14.99%. Business rates are a property tax based on rental values. The rates increase annually, in line with September's Retail Prices Index, a measure of inflation. The ONS this week said the RPI rate of inflation had reached 3.9%. Meanwhile, the UK's key inflation rate climbed to 3% in September, driven up by increases in transport and food prices. The pick-up in inflation raises the likelihood of an increase in interest rates - currently at 0.25% - in November, the first rise in a decade. "Brexit is driving inflation," CVS chief executive Mark Rigby said, urging the chancellor to be "bold" in his November Budget and freeze inflationary rate rises in 2018. "Import prices have risen given the fall in the pound with prices rising faster than wages, causing households to tighten their belts on spending, especially on big ticket items," he added. Under the latest revaluation, which came into effect on 1 April, "transitional relief means big increases to bills are phased in gradually over the five years of the tax regime," according to CVS. In March, the government announced £435m in support to firms facing the steepest increases in bills following the revaluation. 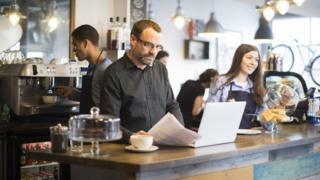 The package, which came after £3.6bn in transitional relief, included capping the increase in bills of 16,000 small businesses to £50 a month this year. "We are delivering the biggest ever cut in business rates to businesses across the country," a Treasury spokesperson said. "The almost £9bn package will see a third of all businesses pay no rates at all and will mean nearly a million companies will see their bills cut," they added. CVS says fewer than half of all councils in the country have revised business rate bills after the introduction of the relief package in the spring Budget. "Ministers mustn't bury their heads in the sand," BRC's Ms Dickinson said. "In his Budget next month, the chancellor needs to get a grip on the matter and rule out a rise in business rates to help save shops, protect jobs, and preserve high streets."